We All Love A Ruckus, But Where Does It Get Us? That’s what President Obama declared last summer when news coverage of town hall meetings on health care focused on protests, shouting and angry crowds instead of the substance of the issue at hand. This entry was posted in Uncategorized and tagged 100 Days, Chris Christie, New Jersey, NJEA on April 30, 2010 by Rich Lee. Can New Jersey Spark Change in American Journalism? This entry was posted in Uncategorized and tagged Bruce Springsteen, journalism, New Jersey on April 21, 2010 by Rich Lee. 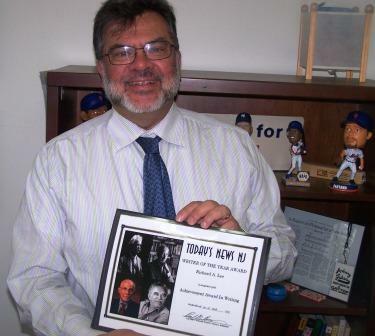 I received my Writer of the Year Award from Today’s News NJ today. My thanks and appreciation to editor Daryl Mikell Brooks for the honor and for posting my columns on media and government issues. 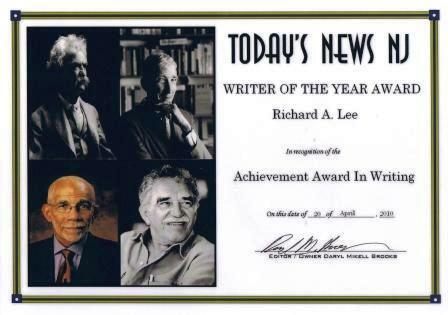 This entry was posted in Uncategorized and tagged New Jersey, Richard A. Lee, Today's News NJ on April 20, 2010 by Rich Lee. The list of public figures who have fallen from grace is a long one. The list of those who have successfully returned to the limelight is much shorter. This entry was posted in Uncategorized and tagged Eliot Spitzer, New Jersey, Redemption, Richard A. Lee, Sharpe James, Tiger Woods on April 9, 2010 by Rich Lee.